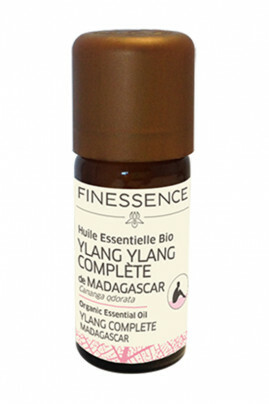 The Finessence Organic complete Ylang Ylang Essential Oil is recognized in aromatherapy for its soothing and soothing properties. A natural antistress, it relaxes the nervous system and calms tensions. Perfect against stress and anxiety, it also fights against depression and insomnia. It brings you serenity and letting go everyday. Its exotic and intoxicating scent delicately perfumes your interior and offers you a moment of relaxation. As a cosmetic active ingredient, it strengthens brittle nails. Tonic hair, it promotes the shine of hair and heals split ends. Ideal for dull hair, lack of vitality! Infusion : In a liter of lukewarm water, mix 3 drops of essential oil, previously diluted in honey or a piece of sugar. Atmospheric Diffusion : Create an oriental atmosphere by adding between 5 and 30 drops in your diffuser of essential oil. Follow the instructions for your device for the time and dosage. Cosmetics: In a teaspoon of vegetable oil of your choice, add 4 drops of Ylang Ylang Bio.tielle 100% Organic Essential Oil with soothing and tranquilizing properties ! A 100% Organic Essential Oil with soothing and tranquilizing properties ! Cananga odorata (ylang ylang) flower oil, linalool*, benzyl benzoate*, geraniol*, farnesol*, benzyl salicylate*, eugenol*, benzyl alcohol*, isoeugenol*. May be fatal if swallowed and enters airways. Causes skin irritation. May cause an allergic skin reaction. Causes serious eye irritation. Harmfull to aquatic life with long lasting effect.